If you are looking for a cat that is as loving as it is beautiful, and one with a very interesting if not convoluted history, check out the Birman cat. These little lovelies have gorgeous colors and markings, and fur that is long and soft. They are friendly and curious, and love to have plenty of playtime, along with just as much cuddle time. This is a great family pet that will love to be around children, because they know they will get loads of attention. Just make sure that your children have been taught how to properly handle pets. How much does a Birman Cat cost? Cats are legendary creatures, some more than others. Take the Birman for instance. This cat is often referred to as the Sacred Cat of Burma, and it has a very striking and magnificent appearance. Legend has it that this cat received its good looks from a blue-eyed goddess, who rewarded the cat’s love and devotion by making his coat golden and giving them blue eyes. The white paws are a symbol of purity, and it is said that priests who died were reborn as Birman cats. Of course, this is just legend, but it is a fact that this is an Asian cat. It really isn’t known how the Birman cat came to be. There are several theories, however. For instance, they may be crosses of Siamese and Persian or Angora cats. Or, the breed may have started in France from a pair of imported temple cats in 1919. The male did not survive the trip to France, but he did impregnate the female during the trip, and she had kittens which started the breed in Europe. In 1925, the Birman was recognized in France as the Sacre de Birmanie, hence the breed name we know today, Birman. This cat was brought to the US in 1959, and recognized by the Cat Fanciers Association (CFA) in 1967. This breed is recognized by the American Can Fanciers Association, the Canadian Cat Association, the Cat Fanciers Federation, and the International Cat Association. Let’s take a look at the physical standards of the Birman cat, including how large they grow, their coloration and markings, any health issues known to the breed, etc. One of the biggest drawbacks about owning a Birman is that they are prone to several health conditions. These include congenital hypotrichosis, corneal dermoid, spongiform degeneration, shaking and trembling in kittens, and very high concentrations of urea and/or creatinine in the blood which could be a sign of kidney issues. One of the great things about the Birman is that even though it has a long, silky coat, it doesn’t tangle or mat a lot. You should brush or comb the coat weekly to get rid of the dead hair and dandruff. In the spring they do tend to shed, so daily combing is a good idea to get rid of the loose hair that can lead to hairballs. You can also give the cat a warm bath to get rid of the shedding. Start bathing your cat as a kitten so they are used to it. The Birman is a long cat that can become quite large. At its shoulders, it can stand up to 10 inches tall, and sometimes even taller. This is a rather big boned cat, and has a tendency to be rather stocky looking. 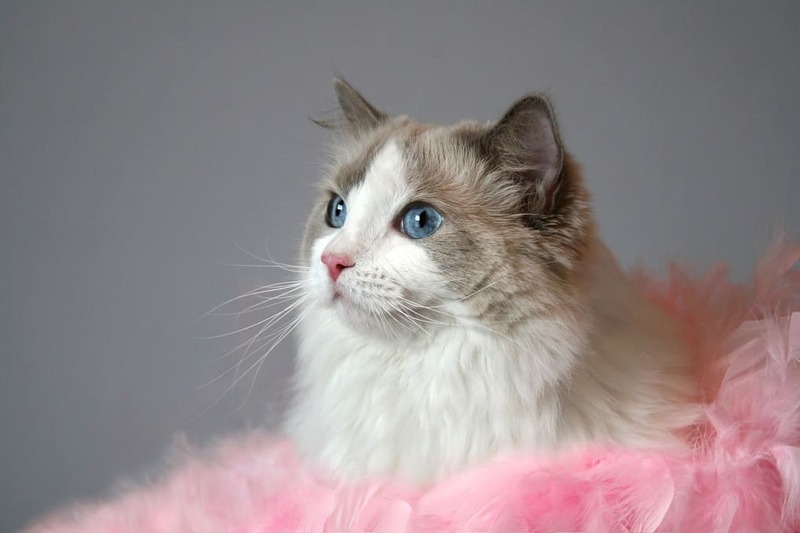 Typically, Birmans weigh between six and 12 pounds. Of course, this will all depend on whether or not the cat is a proper weight or overweight. Male cats tend to weigh more than their female counterparts. The Birman is a cat that likes a good blend of activity and relaxation. It is a very docile cat, but at the same time, it is also extremely curious. This cat loves to explore its environment, and can get into some pretty tricky situations if you don’t cat-proof your home. They even like to go for rides in the car, and will jump in when you are least expecting it. Always keep an eye on what your Birman is doing. There really is no such thing as a hypoallergenic cat, but this doesn’t mean that people with allergies can’t have cats. The trick is to keep pet hair, dander, dandruff, and dirt in the home to a minimum. Your cat will bathe itself, so unless it gets into something there is usually no need to bathe it. Daily brushings help get rid of hair and dandruff, and keep allergens to a minimum. 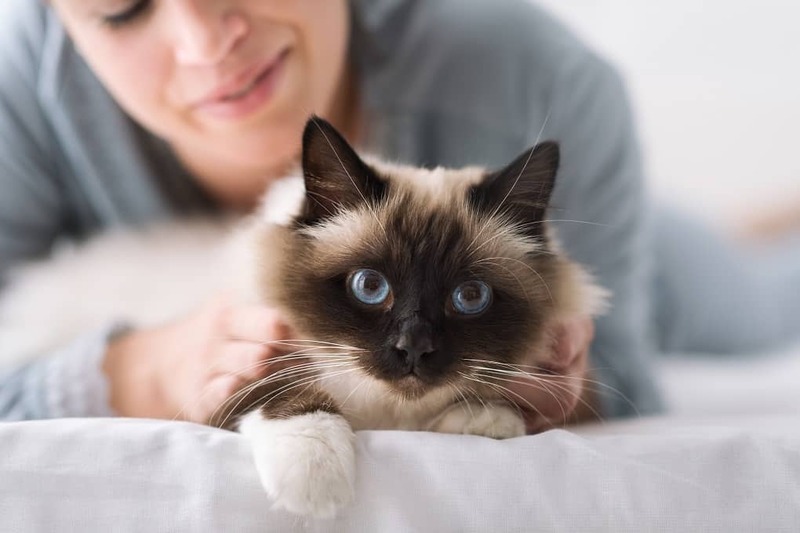 As long as you are making sure that your Birman cat is getting all of the right health care, nutrition, love, and attention that it needs, you should be able to enjoy its company for anywhere from 12 to 15 years. There are no major difficulties in caring for a Birman cat. One thing you should keep in mind is that they do need regular brushing. This is going to help get rid of dead hair, and distribute the skin oils. Get into the habit of brushing your cat’s teeth to prevent periodontal disease, and regularly wipe out the corners of the eyes with a soft, damp cloth. Obviously, this isn’t a cat that you are likely to find in your average pet store, unless they happen to sell pedigreed cats. When looking for a Birman cat, the first avenue should be reputable breeders. If there are no quality breeders in your area, you may have to expand your search and look in other areas until you find just the right breeder. There are a couple of other options as well. Keep your eyes on the classified ads. You never know when someone may be selling their cat because they are moving, have allergies, etc. You should also check local animal shelters. The cost of a Birman cat can range between $600 and $1,000, depending on a variety of factors. Kittens will cost more than adult cats, unless the adult is a champion. If it is retired from showing, the price may be lower. Males tend to cost less than females. There is really only one type of Birman cat, but this doesn’t mean that every Birman cat is going to be right for you and your family. There are many things to consider when choosing a Birman cat. Start with the breeder, and ask a lot of questions about not only the breed, but the cats themselves. Then, make arrangements to “meet” some cats and kittens, and get to know their personalities before making your final decision. Being a pet owner is a big responsibility, and not one to be taken lightly, especially when you are paying good money for a pedigreed pet. The No. 1 responsibility is to make sure your pet receives proper veterinary care. This is going to help prevent various health issues, and catch others in the earliest stages. Make sure your pet has a healthy, well-balanced diet, and that it gets plenty of exercise so it doesn’t become overweight. Also, an indoor cat is a lot healthier and happier than an outdoor cat. 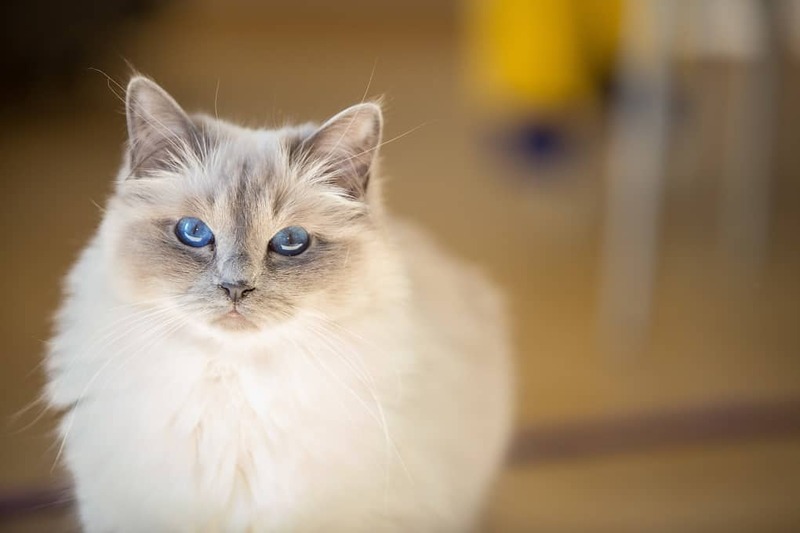 Now it’s time to take a look at the particular characteristics of the Birman cat. This is a cat that is very unique, both in appearance and in personality. This is typically a well-behaved cat, although very curious. It loves to follow its people around, and wants to be a part of the action at all times, whether it is to play or cuddle. The Birman has the pointed pattern found in Siamese cats, with darker colors on the face, ears, tail, and legs. It has beautiful blue eyes and an adorable face. Birman cats love to be held, and make wonderful lap cats. They also love to be involved with what their people are doing. This is a laid-back and very friendly cat that loves to be around children. It is also good with other cats, and can easily get along with dogs. Like most cats, the Birman is highly intelligent. Its innate curiosity can get it into trouble though, so cat-proofing your home is important. This is not an overly energetic cat. It loves to be a lap cat, so you need to encourage regular play to keep them active. Because this is a long-haired cat, it is important to maintain regular grooming, including weekly brushing (daily during the spring when it is shedding). There is really just one type of Birman cat. They all have similar markings, which are akin to that of the Siamese, and they have a stocky build that makes them look chubby, even if they are not. The thing to look for is different personality types. When you find the right Birman cat for you, you will know it. In fact, they will likely let you know it themself once they choose you as their person. The Birman looks a lot like the Siamese, but there is one big difference, and that is the Birman has a long, silky coat rather than a short coat like the Siamese. They both have lovely temperaments, and love to cuddle. The Birman is more docile than the Siamese, and not nearly as vocal. They do love to talk, but they don’t have that loud cry that Siamese cats are known for. If you are looking for a cat that is going to get along well with every member of your family, including dogs and other cats, a Birman is a great choice. This adorable little kitty loves lots of attention, and wants to be a part of everything that is going on in the home.